This animation of model output illustrates the three dimensional complexity which is resolved in this model. A section of the Equatorial Pacific is showcased as it evolves through several ENSO events. This animation of model output illustrates the three dimensional complexity which is resolved in this model. A section of the Equatorial Pacific is showcased as it evolves through several ENSO events. 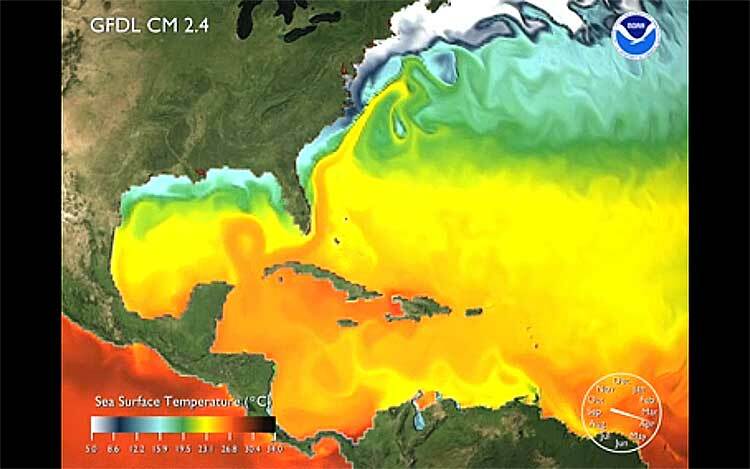 Sea surface temperatures are taken from NOAA/GFDL’s CM2.6 High Resolution Coupled Climate Model which has a nominal resolution of 1/2 degree for the land and atmosphere and 1/10 degree for the ocean and ice. 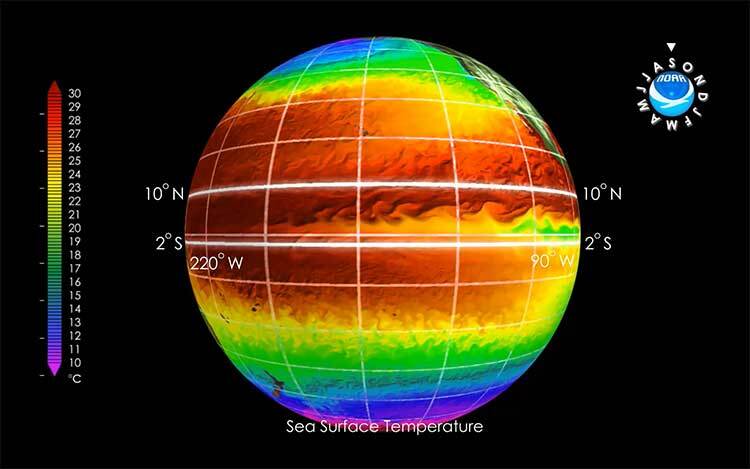 The surface temperature are daily output while the subsurface temperatures are interpolated from monthly output. Salient features are the tropical instability waves and their subsurface impact, the evolution of the tropical thermocline through the events and the impacts of the presence of a well represented Galapagos Archipelago. Daily model output of surface chlorophyll is animated and shown gloablly. 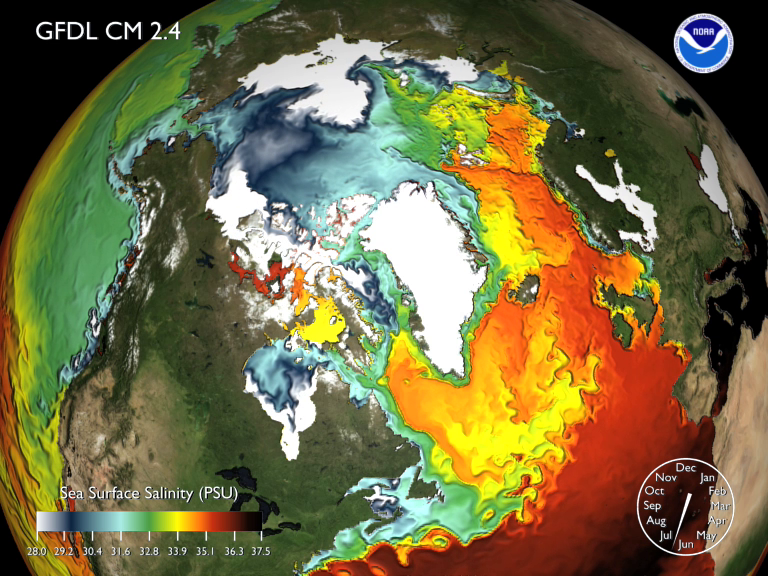 This animation highlights the models ability to simulate a biological quantity which has global ramifications on the physical and biological climate systems. Daily model output of surface chlorophyll is animated and shown globally. 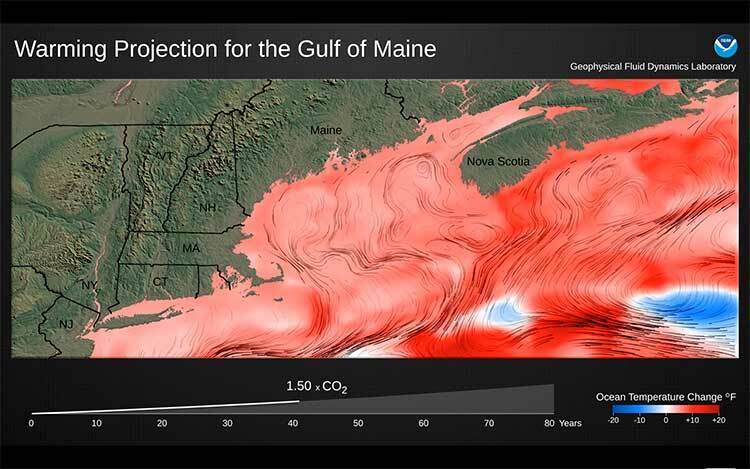 This animation highlights the models ability to simulate a biological quantity which has global ramifications on the physical and biological climate systems. 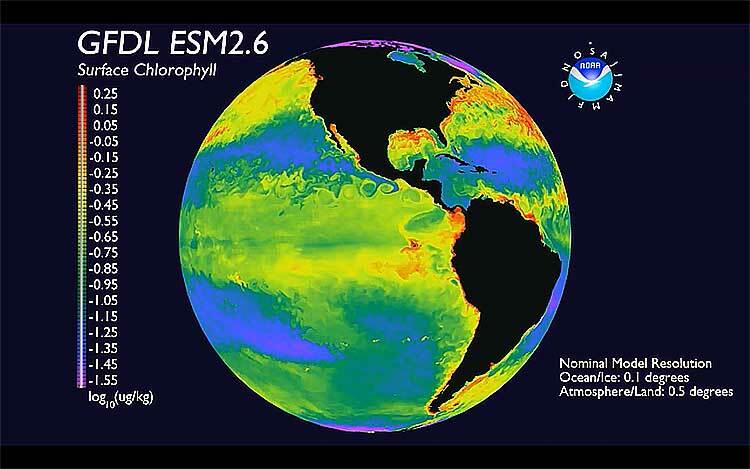 The model from which the chlorophyll is taken is the biogeochemically comprehensive Carbon, Ocean Biogeochemistry And Lower Trophics (COBALT). This model focuses on multi-elemental biogeochemical coupling while sacrificing ecological comprehensiveness through a high degree of ecological empirical parametrization via Dunne et al. (2005). 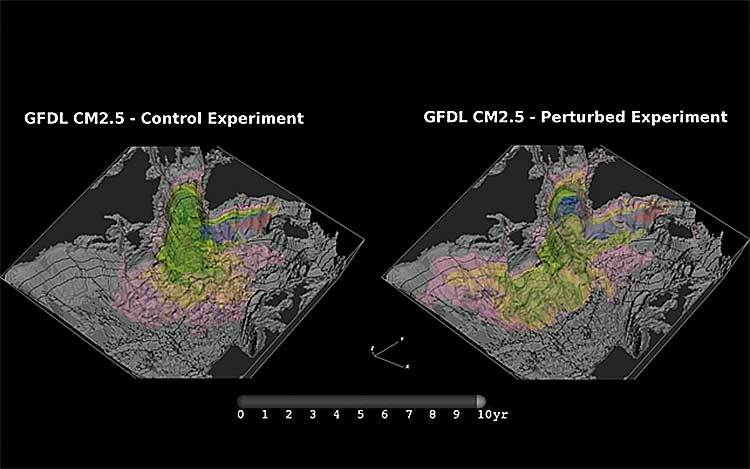 The physical model used to drive COBALT in this simulation is NOAA/GFDL’s CM2.6 High Resolution Coupled Climate Model. 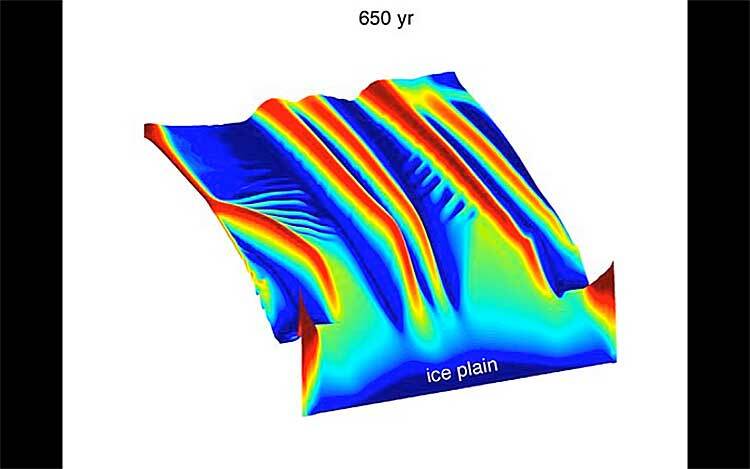 Formation of melt channels on the base of the ice shelf. Shape shows the shape of the ice-shelf base, colors show the plume flux. View from the grounding line towards ice front. The movie shows results of simulations of a fully coupled ice-shelf-flow/sub-ice-shelf ocean circulation model. The ice shelf has no-slip conditions at the lateral boundaries. Frames are taken every 10 years. In the control experiment using CM2.5, the Nordic Sea overflow entered into the North Atlantic deep ocean is very weak. The passive dye is released continuously from the Denmark Strait with a constant concentration of 1. 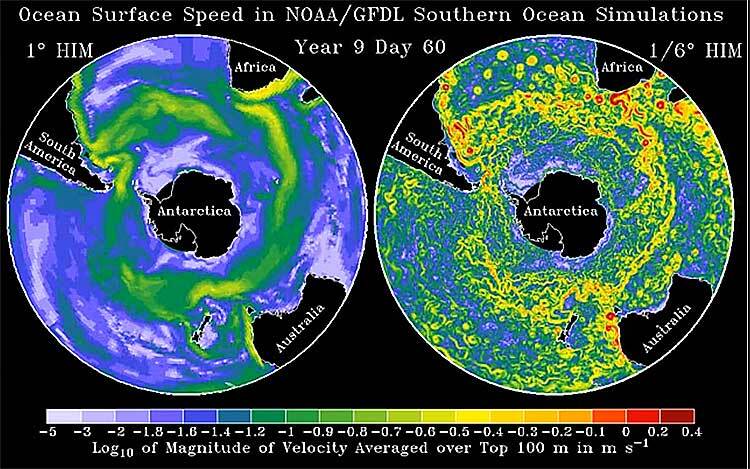 Due to the lack of a strong deep current near the western boundary south of the Flemish Cap, the younger age tracer and the passive dye released from the Denmark Strait are mainly confined to the subpolar region and do not penetrate to south of the Grand Banks. On the contrary, in the perturbed experiment, when a much stronger Nordic Sea overflow enters into the North Atlantic deep ocean through the Denmark Strait, the younger age tracer and the passive dye released from the Denmark Strait show much higher concentration near the western boundary and less eastward distribution in the interior ocean, and can reach the western North Atlantic basin south of the Grand Banks due to the advection by the stronger deep current. The simulated concentration (in parts per billion) of dissolved oil in the ocean mixed layer (near the sea surface). The simulated ocean currents used here are plausible but should not agree in detail with the observed currents. The simulated concentration (in parts per billion) of dissolved oil in the ocean mixed layer (near the sea surface). The simulated ocean currents used here are plausible but should not agree in detail with the observed currents. The source of oil is steady between April 20th and July 15th but the plume wavers back and forth with the changing ocean currents. 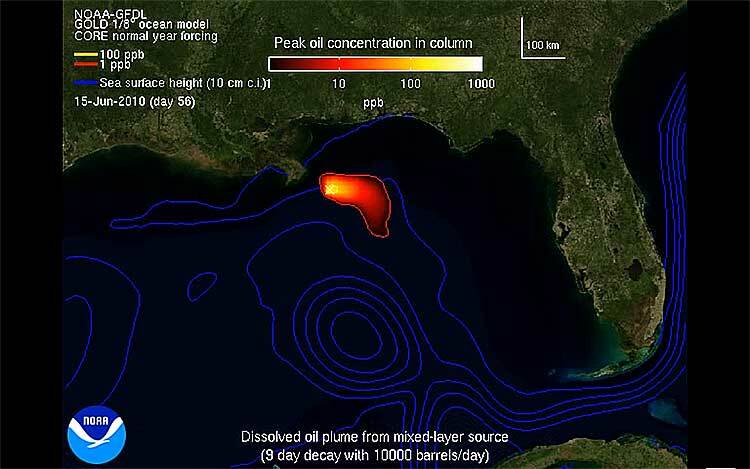 The initial position of the loop current can affect the exact location of the dissolved oil plumes, but will not substantially alter the confinement of the significant concentrations to the Northern Gulf of Mexico, provided that the microbial oxidation is taken into account. 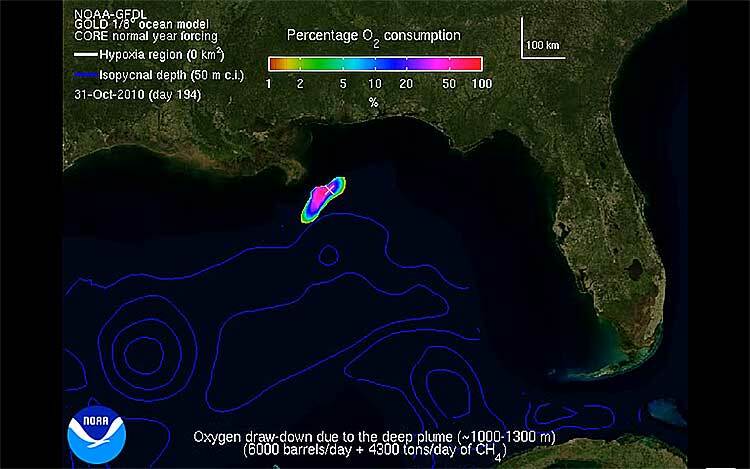 In contrast to the first animation, animation 2 shows what happens if microbial decay is omitted (as in some previous studies); the strong surface currents can spread the plume of dissolved oil throughout the Gulf of Mexico and as far as the Florida Straits and beyond. 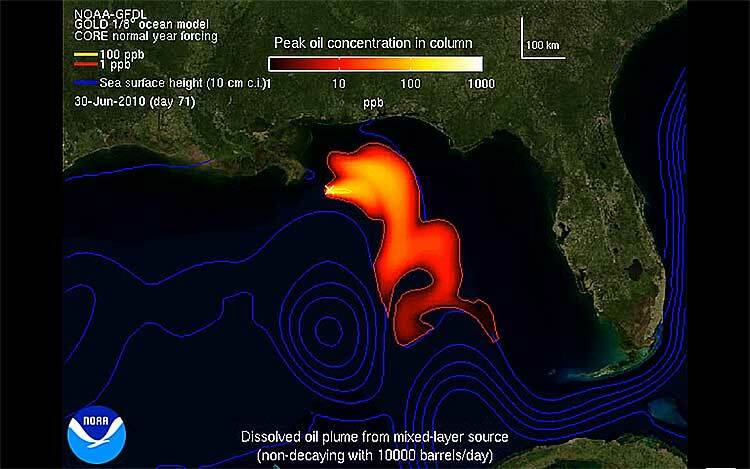 In contrast to the first animation, animation 2 shows what happens if microbial decay is omitted (as in some previous studies); the strong surface currents can spread the plume of dissolved oil throughout the Gulf of Mexico and as far as the Florida Straits and beyond. This extensive spreading of dissolved oil is not what has been observed and we do not believe that this animation is representative of actual events. The percentage draw down of dissolved oxygen for a 300 m thick deep plume (as a percentage of climatological levels at 1,000-1,300 m depth). The percentage draw down of dissolved oxygen for a 300 m thick deep plume (as a percentage of climatological levels at 1,000-1,300 m depth). The regions of significant oxygen depletion remain confined to the source region. If the actual plume were much thicker, both the hydrocarbon concentration and oxygen draw down would be proportionately smaller due to dilution. Monthly ocean temperature and ocean current speed/direction (0-200 m) under a transient climate response (1% per year increase in atmospheric CO2). 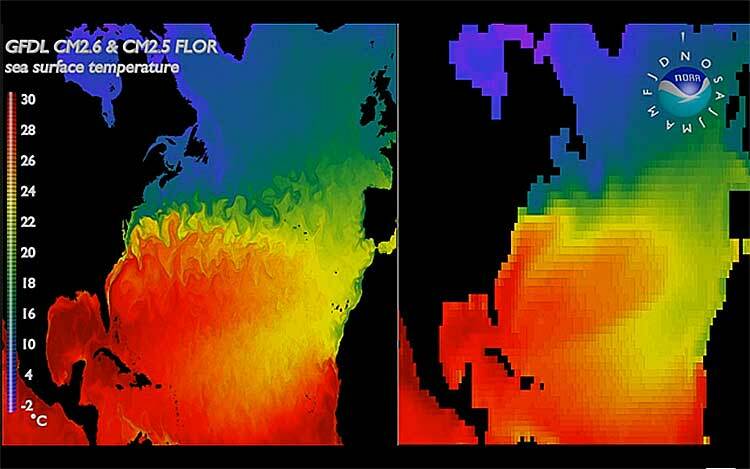 Sea surface temperature simulation from 1/10o and 1o resolution ocean models coupled to the same 1/2o resolution atmosphere model. 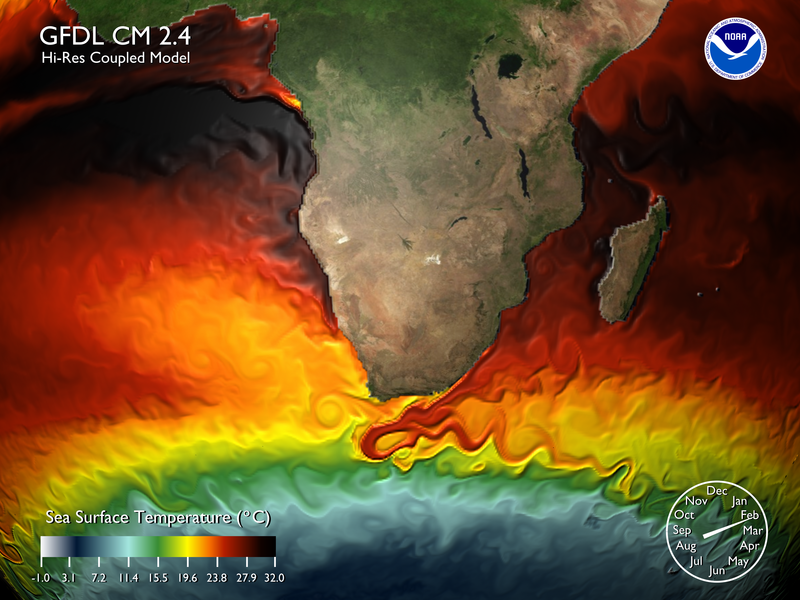 The animation shows the impact of ocean resolution on the simulation of ocean currents and eddies. 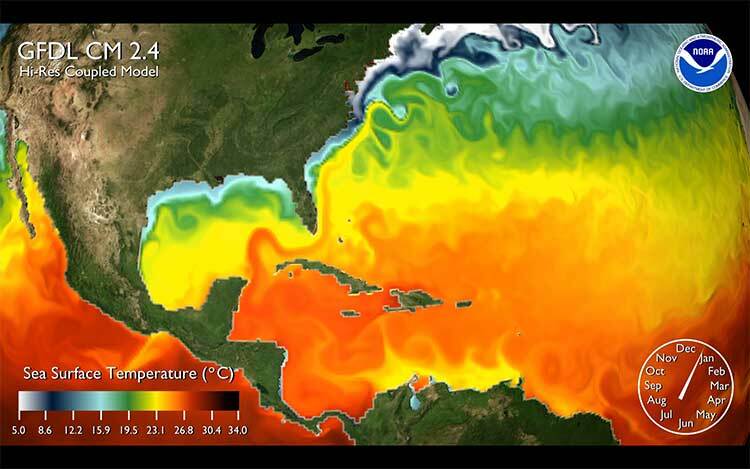 Sea surface temperature (SST) simulation from GFDL’s high resolution coupled atmosphere-ocean model. As the animation focuses on various locations of the world ocean we see the major current systems eg. the Agulhas current, Brazil current, Gulf Stream, Pacific Equatorial current, Kuroshio current. The small scale eddy structure is resolved and evident. 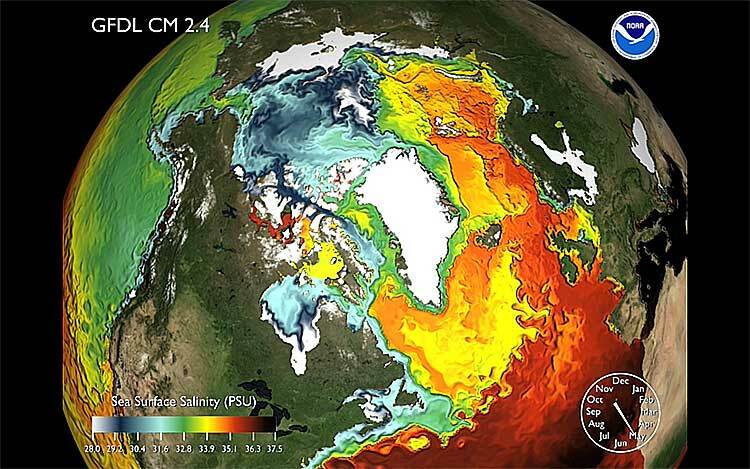 This is a simulation of the Arctic Ocean Surface Salinity from GFDL’s high resolution coupled model. One can see the seasonal cycle of summertime freshening from sea ice melt as well as the salty water entering from the North Atlantic current. 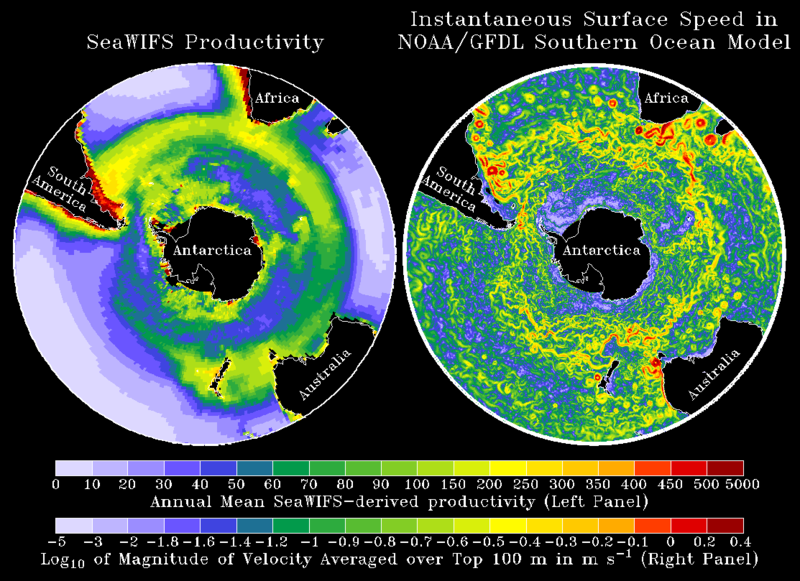 The animation focuses on the Loop Current as it flows into the Gulf Stream (a major surface current). Note the black colors indicate the warmest ocean surface temperatures and and light blues indicate the coolest temperatures. 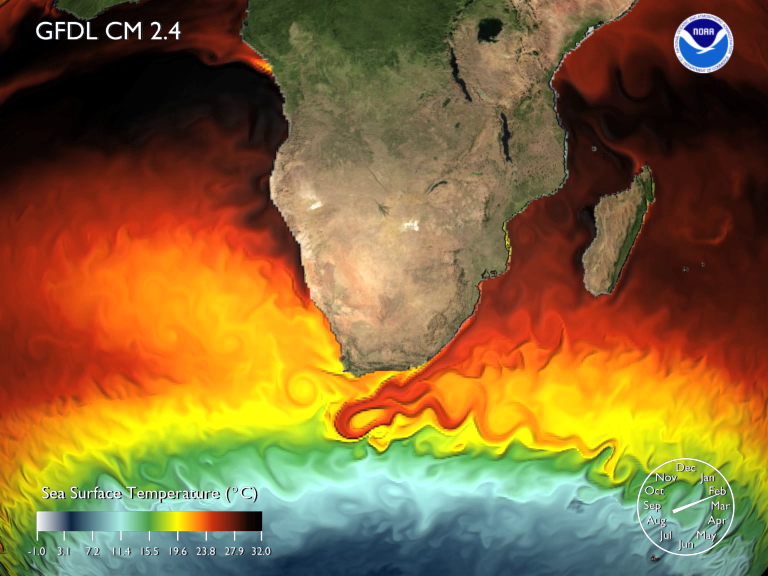 Sea surface temperature (SST) simulation from the Geophysical Fluid Dynamics Laboratory’s (GFDL) high resolution coupled atmosphere-ocean model. A three-dimensional ocean circulation model has been used for studying both the ocean climate system and more idealized ocean circulations. 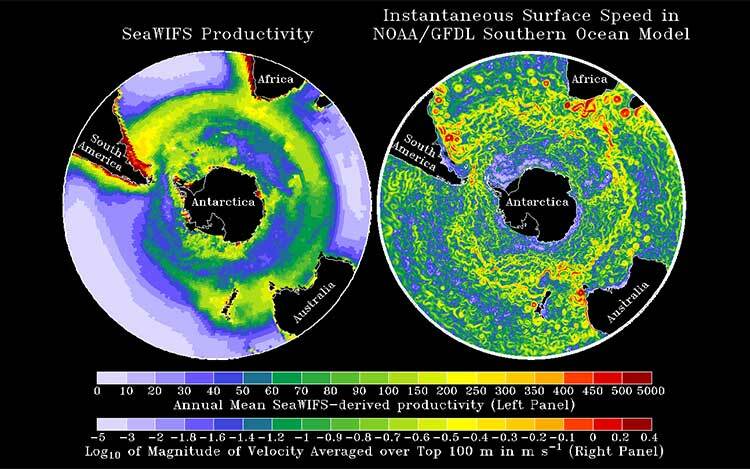 The figure shows us that southern ocean productivity may be linked with eddy activity.